What do you get when you mix the looks, power, and dependability of a BOSS HOSS MOTORCYCLE with an extra wheel and a whole lot of personality?? The BOSS HOSS TRIKE, of course. 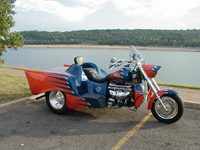 All trike models are powered by either the 350 inch ZZ4 or the all aluminum 376 cubic inch LS3 power plant. Now this is what you call a hot rod. In fact, you won't find many hotter than our '32 LOW-BOY COUPE. The redesigned LOW-BOY COUPE body provides trunk storage access to accommodate larger cargo. All Boss Hoss Trikes are fitted with a floating four piston caliper Brembo rear brake system, which compliments the dual four piston caliper floating-rotor system found on the front of all Boss Hoss Motorcycles. Our trikes are equipped with a 3-speed automatic transmission with reverse. You want plenty of room for your stuff?? Then take a look at our SIERRA TRUCK TRIKE. You won't find a more spacious trunk on a trike. Plus, you won't find a more powerful trike to haul you gear anywhere on this planet. Adjustable foot controls make customizing the ergonomics of our trikes to your liking a breeze. Add to that, locking trunks and contoured seating, and all three Boss Hoss Trike models are winners! Boss Hoss trikes deliver comfortable cruising and incredible power, all wrapped up in a head turning design. Take a look at the 57 Chevy model- what personality! A redesigned trunk lid and inboard hinges on the '57 model improve trunk storage. Front 130/90-16, 3.50"x16" 130/90-16, 3.50"x16"
Rear 230/60, 7"x15" 230/60, 7"x15"